Join betway, opt in, deposit £10 or more and you will get a 100% matched amount, up to £30 as free bets to split however you like. T&Cs apply. 1 x wagering at odds of 1.75+ to unlock free bet. Deposit by card or paypal only. Join 888sport using promo code RACING and when you bet £10, you'll get £30 in free bets PLUS £10 in free bets on any horse racing market. Min deposit £10. First bet minimum odds 1-2. Free bet credited upon qualifying bet settlement and expires after 7 days. Free bet stakes not included in returns. Deposit method and withdrawal restrictions apply. T&Cs apply. As acceptance speeches go Perry Martin's ticked the box for being memorable, but the owner's bizarre rambling address after picking up the award for California Chrome being crowned Horse of the Year on Saturday will be remembered for all the wrong reasons. While the world had been captivated by the comments of Meryl Streep at the Golden Globes, Martin left his audience confused as he spoke incoherently for more than six minutes at the Eclipse Awards ceremony. The majority owner of California Chrome, who also bred the Kentucky Derby and Dubai World Cup winner, complained at length about the racing and local media before being ushered off by the band striking up. Martin's only congratulations and thanks were paid to himself at the start of his speech as he said: "We won the older horse of the year award earlier tonight and everybody told me I did a wonderful job. I just want to say, ditto." What followed was a series of attempted jokes and anecdotes from Martin as he corrected and belittled the media over articles and interviews conducted with him over the past three years. As Martin warmed to his task the crowd who joined him on stage looked increasingly bored. Among the accusations from the owner was that the media treated him no differently to a mass murderer. He said: "The local media sent a crew to our home before the Kentucky Derby and they were interviewing our neighbours. I said to my wife Denise ‘They don't seem to be able to separate us from mass murderers. For mass murderers they send reporters to their house and interview their neighbours. People who have favourites for the Kentucky Derby are treated the same way.'" Veteran US turf reporter Ray Paulick described the rambling monologue as "the most graceless acceptance speech ever given by the owner of a champion racehorse". 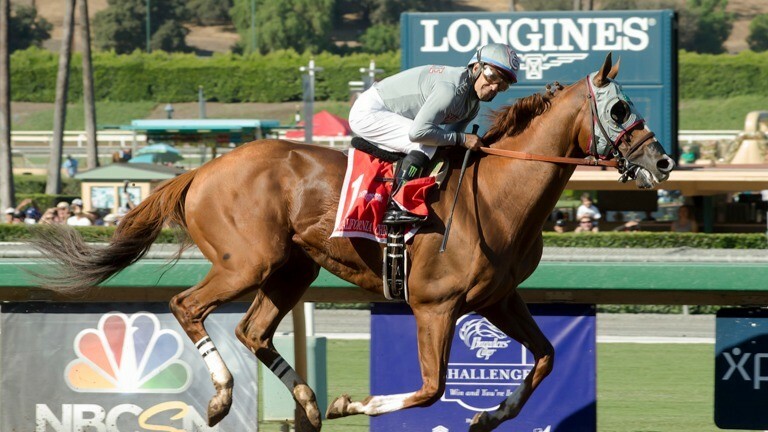 California Chrome is set to have his final race in Saturday's $12 million Pegasus World Cup before he is retired to stud.